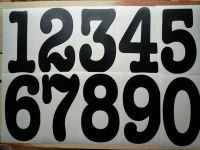 A set of 4, Swiss (Switzerland) flag stickers. 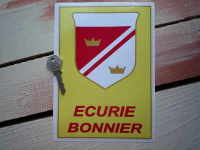 Set includes two 2" stickers (each measuring approximately 50mm by 29mm) and two 4" stickers (100mm by 57mm). Electrical & Fire Extinguisher Switch Stickers. 30mm, 50mm or 80mm. 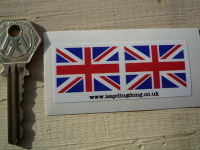 Union Jack Flag Oblong Stickers. 33mm Pair. Union Jack Stickers. Set of 4. 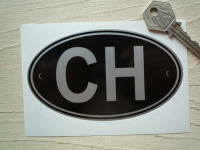 Royal Enfield RE Disc & Flags Black & Clear Sticker. 3". 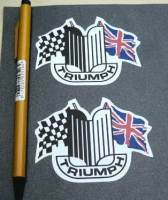 Triumph Shaped Crest & Flags Stickers. 3" Pair. 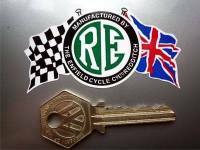 Royal Enfield RE Disc & Flags Coloured Sticker. 3". 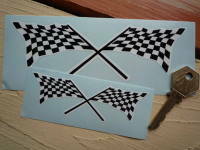 Chequered Flag Crossed Mallory Park Style Sticker. 4", 6" or 8". 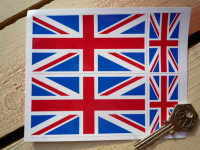 Union Jack Flag Beige Oblong Stickers. 33mm Pair.